Born and raised in Texas, I was influenced by a German father who believed in order and beauty and a mother who 'decorated' our home and constantly worked on making it beautiful. My father believed in all things beautiful. He always wore his tie to dinner with our family and he always pulled out my Mother's chair and only sat down when she was seated - he was quite a gentleman. My mother worked with the architect when our home was remodeled and used four colors in the kitchen - mid century modern for sure. And then several years later our home became eclectic as Mother fell in love with antiques and the modern furniture was replaced with antiques. But it was only after moving to Houston and embarking on a career in interior design, that I realized how much my early years impacted my life. My childhood, education and traveling the world have really influenced my design aesthetic. I am a firm believer that all interiors should be universally designed and that the designs should be timeless. I aspire to a look that is like an interior designer has never been there but that the home has evolved over time and is a true reflection of its inhabitants. Travel is more than an escape from the everyday. It renews and cleans the soul, reenergizing our spirit and helps us to see the everyday from a new perspective. Whether it's a historical building, a garment, a rug, a mosaic, a color, a shape or the vast beauty of a landscape created on nature's canvas - when we travel, we are forever changed and touched. Reliving and remembering that experience is a real gift and it easily translates into GREAT interior design. Donna was the first recipient of a first place in the Southern Accents/ASID kitchen contest. Vining Design Associates, Inc. has won numerous other awards and is published frequently in local and national publications. Donna has completed projects in Florida, Maryland, Colorado, and Texas and is currently working on projects in Florida and North Carolina. Her work also includes many commercial projects including Strike USA, the Houston Contractors Association and the Custom Sales Office for the Woodlands. She believes in a team approach and that good project management is essential for a successful project. Donna Vining , NCIDQ, FASID, IIDA, RID, CAPS, REGREEN Trained™ is President of Vining Design Associates, Inc. and a Registered Interior Designer in the state of Texas. 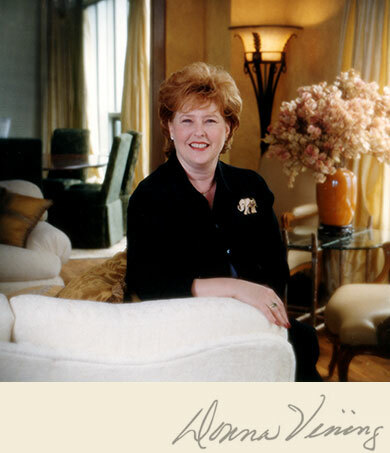 She is also the Executive Director of the Texas Association for Interior Design. She is a past chapter President of the Texas Gulf Coast Chapter of ASID and Past Chair of the Council of Presidents, as well as a national ASID board member and a member of the ASID Legislative Advisory Council. She is a past President for the National Council for Interior Design Qualification (NCIDQ). In addition to her interior consulting business, Donna is partners in a speaking company, Seminars by Design. She not only talks the talk, but walks the walk. She has been sought after for her expert training in universal (barrier-free) design and environmental design. She believes all interior designers today should be doing both. She is a Certified Aging In Place Specialist (CAPS) and a REGREEN Trained professional. She shares her motto by Ghandi, "Be the Change you wish to see in the World". ©Copyright Vining Design Associates, Inc.